If there’s one thing that makes Beverly Carraher’s day, it’s making someone else’s. That’s why it surprises no one at Harris School Solutions that she is this quarter’s We Are Harris award winner. 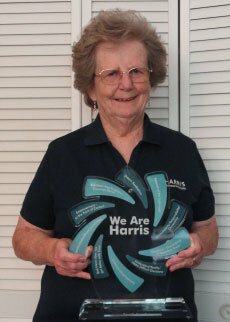 Beverly, a senior software support specialist at Harris for the past 12 years, was nominated for a career spent consistently displaying not one, but two, Harris core values – Respect of the Individual, and Communicate/Share Knowledge. Both of these ideals insist on a team member’s willingness to genuinely value and appreciate each person across every interaction. And that’s how Beverly will be remembered following her retirement at the end of this month. As for Beverly herself, she’s looking forward to exploring that world: she plans to shift gears and spend her retirement traveling and visiting with her children and grandchildren throughout Florida, Virginia, and Massachusetts. One thing that won’t change, however, is that her husband, Bob, will be by her side on these trips as he has been throughout her career. Beverly credits Bob with providing the generous support she needed to focus on her work over the years. Beverly has made the day better for everyone around her, every day, for twelve years. So as far as accomplishing something? You certainly have, Bev. Good luck out there. We will miss you.